Gina Haspel, the first woman nominated to lead the CIA, almost stepped aside over the weekend. The Washington Post reported that Haspel was willing to withdraw rather than face tough questions over her role in the CIA's waterboarding campaign. But the CIA says she remains on track for a Senate confirmation hearing Wednesday. 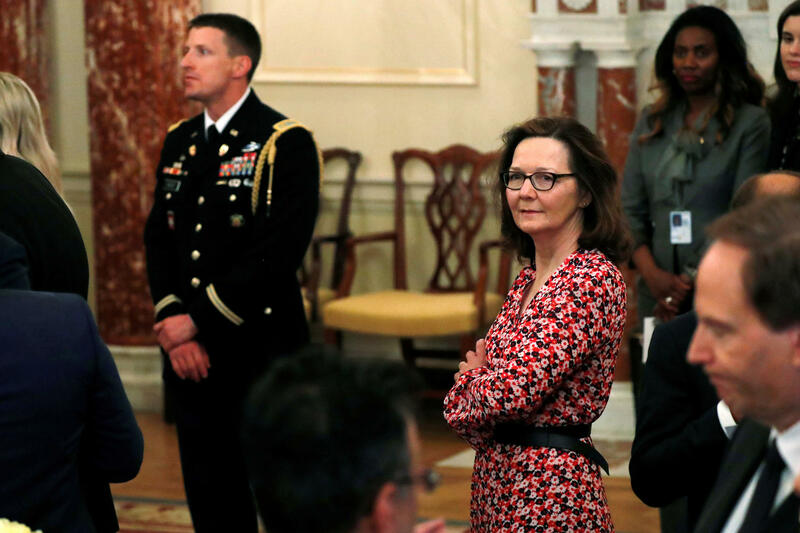 NPR's Greg Myre looks at Haspel's career and the controversy that looms over it. GREG MYRE, BYLINE: Gina Haspel is a spy's spy. She spent 32 years undercover at the CIA before becoming deputy director last year. Much of her life remains shrouded in mystery. There are just a few public photos. The only voice recording we found is from a banquet last October. Haspel is honoring the memory of a legendary spy who'd recently died. GINA HASPEL: Good evening. Last February, a few days after I was sworn in at CIA, I had the honor of receiving a letter of congratulations from my dear friend Ambassador Hugh Montgomery. MYRE: The CIA is only selectively lifting the veil over Haspel's long career. She joined the agency in 1985, a few years after graduating from the University of Louisville. She's held 20 separate jobs, including seven foreign postings. They're only identified by region - Africa, Europe, Eurasia. The languages she learned - Russian and Turkish - hint at her assignments. FRANK ARCHIBALD: Gina is a consummate professional. MYRE: Frank Archibald was the CIA's director of clandestine services before he retired three years ago. Haspel was his deputy. ARCHIBALD: Gina will bring to the table a personal and granular knowledge of what it's like to be an operator, to go down the dark alley and meet a source. MYRE: Democratic Senator Ron Wyden of Oregon has a different take. RON WYDEN: I am very familiar with the classified material. I think the vast amount of this can be declassified. MYRE: Wyden is on the intelligence committee that will question Haspel. WYDEN: I think the agency is covering up her background because if the American people knew what I knew, I think that there would be many senators who would say, look, there's no choice but to reject your confirmation. MYRE: Haspel has taken on some of the toughest jobs in counterterrorism. A high point came in 1998 when she was the station chief in a country the CIA won't name. After deadly al-Qaida bombings at U.S. embassies in Kenya and Tanzania, Haspel worked closely with the country where she was based. The CIA says this led directly to the arrests of two men who are still imprisoned. Again, Frank Archibald. ARCHIBALD: I never saw a moment be too big for Gina because she had the resilience based on her personal character to say whatever the bad guys throw at us, you know, we're going to come back. MYRE: Haspel's most controversial moments came a few years later. She was at a black site prison in Thailand where al-Qaida suspects were waterboarded in 2002. And in 2005, she wrote a cable calling for the destruction of videotapes that showed that waterboarding. Daniel Jones was a Senate intelligence committee staffer at the time. He said that revelation prompted senators to call for an expanded investigation. The result was the so-called torture report that he helped write. DANIEL JONES: The creation of that cable by Gina Haspel and her advocacy for the destruction of the tapes really led to the eventual 7,000-page report. MYRE: Today, the law is clear. Waterboarding is illegal. The CIA says it's out of the interrogation business - something Haspel has been telling senators in private meetings. But her nomination has raised the issue anew, says Chris Anders of the ACLU. CHRIS ANDERS: Gina Haspel is unique. She is the only one who has been nominated for office who had an operational role in the use of torture. MYRE: If confirmed, Haspel will be the first CIA chief in decades who spent her entire career at the agency. She has strong support from CIA veterans, like Jeanne Tisinger, who's now retired. JEANNE TISINGER: I think Gina is incredibly well-qualified and, simply put, is the best choice for the role. MYRE: But Senator Wyden says the debate needs to be more public. WYDEN: You ought to have an open debate about a nominee. A nominee ought to take public responsibility for their actions. And senators have to answer an informed public for their votes. MYRE: Haspel's hearing on Wednesday will have both an open and a closed session. Greg Myre, NPR News, Washington. (SOUNDBITE OF STEV AND JHON MONTOYA'S "SLOWMOTION FALLING") Transcript provided by NPR, Copyright NPR.